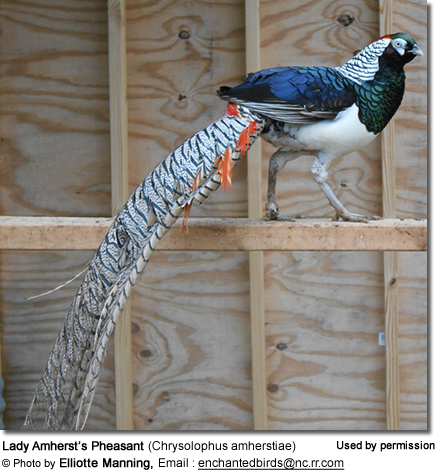 The Lady Amherst's Pheasant (Chrysolophus amherstiae) are native to south western China and Tibet, but have also established a self-supporting, but now declining, feral population in England. This species is closely related to the Golden Pheasant (Chrysolophus pictus). They feed on the ground on grain, leaves and invertebrates (= animals without internal skeleton, such as insects, larvae, earthworms, millipedes, snails, spiders). The adult male averages 43 inches (~110 cm) in length, its tail accounting for 31 inches (~80 cm) of the total length. It is unmistakable with its black and silver head, long grey tail and rump, and red, blue, white and yellow body plumage. The "cape" can be raised in display. The female (hen) - featured below - is much less showy, with a duller mottled brown plumage all over, similar to that of the female Common Pheasant but with finer barring. She is very like the female Golden Pheasant, but has a darker head and cleaner underparts than the hen of that species. 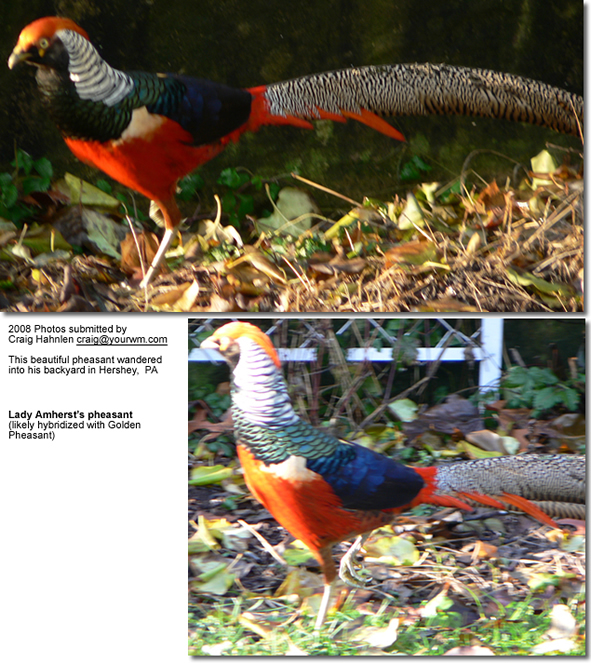 Amherst pheasants should be kept separate from the Golden pheasants to prevent cross breeding. 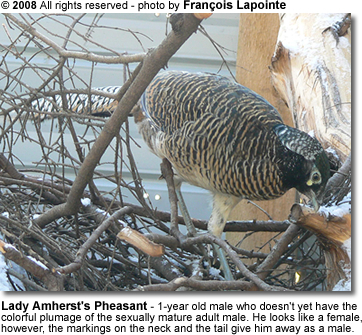 The Amherst will readily hybridize with the Golden Pheasant and the offspring are usually fertile. Unethical breeders will try to sell "hybrids" as new mutations as a way of "cashing in"-- and you are well advised to ask for proper records and photos before purchasing such advertised "new mutations." It is considered bad practice to breed hybrids as it causes damage to pure blood lines. Visual clues that will help you to identify hybrids. These pheasants may breed their first year, but it is better to use a fully colored male to not loose fertility. Their breeding season starts in May and they attain breeding age in their second year. The hens average twenty eggs a season depending on the feed and care. The hen lays 6 to 12 creamy buff eggs, which she incubates for 23 to 24 days. A monogamous species, it is best to keep the pair with their young from the previous year. Some males have actually helped in rearing young, but not all males make good parents. The males can get aggressive with the females when caged, and having the other birds helps dilute this activity. It is also supposed to help to keep them in mixed aviaries, including doves, small hookbills, finches. peafowl and eared pheasants in their aviary. Peanuts are often offered as treats -- however, peanuts are often contaminated with aflatoxin, a fungal toxin. Aflatoxin is carcinogenic and causes liver damage in birds, other animals, and even humans. Roasting reduces aflatoxin but does not eliminate it entirely. North American peanut producers are currently working on eliminating contaminated peanuts from their products. Especially peanuts with dark spots on them should be considered suspect, but even those that look clean and perfect could possibly be contaminated.